The school year is upon us. And with a back-to-school, back-to-juggling-multiple-activities mindset, it is easy to forget about something that I feel is of utmost importance: good, old-fashioned fun! Yep, making time to laugh and chat while enjoying face-to-face interaction should be a given every single day of the year. However, time for family fun is easily overlooked as fall frenzy supersedes the slower-paced days of summer. In fact, it seems that once the big yellow busses are back on the road, whole days can go by without an entire family being at home and awake at the same time – forget about home, awake and laughing together. 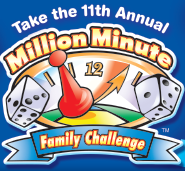 Perhaps the Million Minute Family Challenge, which runs from September 1 through December 31st. It’s a fun grassroots initiative to encourage interaction among family and friends through playing games together. And, it’s something I’d like to invite you to join in on. I am not suggesting that you carve out a million minutes of your precious time. Just a handful – sometime between September 1 and December 31st – to sit down to play a non-electronic game with your family or friends. That’s right – a board game! (No bored about it. Once you break open the box, you will likely find yourself having fun.) Then, leave a comment on this post to let me know how many minutes you’ve played. I will check the comments regularly and log all our Signature Mom community minutes at the Million Minutes site. That way, we’ll be able to see how we – as a Signature Moms community of bloggers and readers – are racking up the fun times while helping all Million Minute participants to reach the collective goal of one million minutes of play time. And reach it we will! Last year, my family enjoyed joining in the challenge, and, together with the other participants, recorded 1,063,120 game-playing minutes from September-December 2010. Need some goals? I say, start with one you can definitely conquer – say 20 minutes. Like to reach higher? Go for it! See if you can beat any of last year’s game players. The top-minute logging family last year recorded 19, 413 minutes. A top community group logged 49, 635. A top homeschooling group logged 32,097. And, a top school logged 51, 620. That’s a lot of folks sharing a lot of fun. I wonder how many minutes our Signature Moms community will enjoy? However many we log, I’d love it if we’d stay active here through comments. Please share what your family’s personal game-playing goals are. (You can print out a Minute Tally Sheet to help you keep track of reaching it.) Also, share your experiences with different game or leave links with recommendations, reviews and ideas. Or, simply what, through comments about your family’s successes and challenges with playing games together. I think doing so will be a great way for us not to not only to make time for our families and friends this fall, but also to increase our conversation and sharing here. Who knows? If enough of us get into this, maybe we can even meet in-person for a family game day or night. Are you game? (Pun intended!) Then, don’t delay. Break out a game, have fun, and, then, stop by here to share how it went, being sure to leave a note about how many minutes you played so I can log them in. And, if you are really into it and would like to organize a separate group of Million Minute participants, go for it. Boy Scouts. Girl Scouts. Schools. Religious Groups. Libraries. Playgroups. Homeschoolers. Traditional Educators. Clubs. Everyone is welcome to join in. Online, there are resources for parents and teachers alike, as well as an Organizers Kit. Now, let the games begin, Signature Moms family and friends! great idea! I’ve never heard of this before. Can we count those hurricane days with no power?! cannot get the pdf to print? the link does not work correctly?